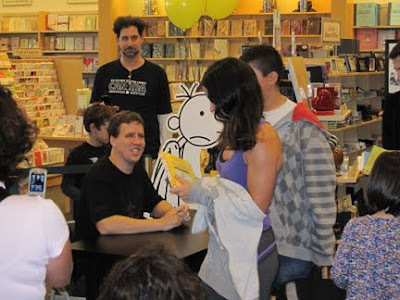 Jeff Kinney, author of the Diary of a Wimpy Kid series, had a signing at a Barnes & Noble bookstore about an hour from my home yesterday, and invited me down for a late lunch beforehand. I really didn't intend to mention it here. Spending time with a friend and then breathlessly blogging about it seems very uncool. However, I found the experience so unique and interesting I couldn't resist. Plus, as you'll see, Jeff knew I'd write about it. My rationalization: very little of this post--just one tiny story--is actually about Jeff. Mostly, it's about the world around Jeff. WimpyWorld. 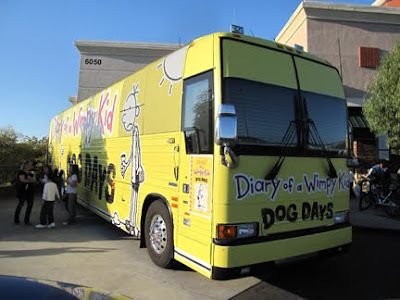 Here's what you need to know: Jeff is on a book tour to support his new book, Diary of a Wimpy Kid: Dog Days, which is currently the bestselling book in the United States. Not kid's book, not graphic novel--the bestselling book, more than Dan Brown, Stephanie Meyer or Sarah Palin. This is the fourth book in the Wimpy Kid series. The first three books remain numbers 23, 24 and 29 on USA Today's list of the Top 150 Bestsellers. Altogether, they've sold tens of millions. A movie is coming out next spring. It's not quite Harry Potter territory, but it's close. I know Jeff because we have the same editor and publisher. I was at the New York Comic-Con the day Jeff brought his book idea to Editor Charlie, and Jeff has been gracious enough to mention that he did so because he knew Abrams had published Mom's Cancer. So I witnessed Wimpy Kid's publishing birth, and gave Jeff some early advice that he remembers fondly even though he doesn't need it anymore, and we've stayed in touch. Let's just agree that he owes it all to me. Jeff's signing yesterday was due to start at 5 p.m. We arranged to meet in front of the bookstore at 3 p.m. I arrived early to find a few hundred people already waiting in a line that meandered around the perimeter of the parking lot. They weren't waiting to see Jeff; they were waiting to get a ticket to see Jeff. Mall security looked like it was already overwhelmed and frantically called in reinforcements. A policeman cruised through to figure out why a line of pedestrians was backing up onto the city sidewalk a block away. I called Jeff's cell. The line along the parking lot when I arrived. It quickly grew to turn right down the lane in the distance and spill out onto the city streets. "Jeff, I'm in front of the store. I don't think you want to meet me here." I described the scene. He was surprised; apparently crowds have been more modest elsewhere. "All right," he said. "When you see the bus, just knock on the door. We'll let you in and find somewhere to eat." "You didn't know about the bus?" "No. You have a bus? A bus bus?" Jeff laughed. "You'll know it when you see it." The bus. It's usually rented by rock bands on tour. Its previous occupant was the singer Pink. I offered the driver $100 to drive it down my block. He didn't. The crowd roared. Well, since most of the crowd was younger than 12, it more squealed than roared. Either way, it got excited and loud. I jogged to intercept the bus some distance from the bookstore. Instead of letting me on, Jeff got off, and we ducked into a restaurant while the bus continued to the store, a giant yellow decoy. We had a very nice, quiet time to relax and talk over a pizza, which I ate most of because Jeff has learned not to tackle a marathon booksigning on a full stomach. I let him pick up the check anyway. Two big, loud families of Wimpy Kid fans came in and sat behind us; Jeff kept his head down. We finished and walked over to the bookstore, where the line had vanished because folks had gotten their tickets and either gone inside or left to return later. 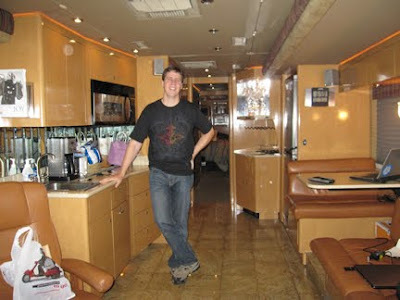 Jeff inside the bus. Big-screen TV and entertainment center, full bath, a big master bedroom in the back and six bunks for roadies (which he doesn't have). Evidently, driving around the country in one of these costs about the same as flying from city to city, with a lot more comfort and less hassle. Jeff invited me to stay aboard and ride to Los Angeles with him last night. I may kick myself the rest of my life for declining. Finally making myself useful, I found Publicist Jason (who travels with Jeff) and helped smuggle Jeff through a side door into a back room of the store. It was now about 4 p.m., and the store had begun a scavenger hunt and other games to keep hundreds of little rascals busy, happy, and non-destructive. 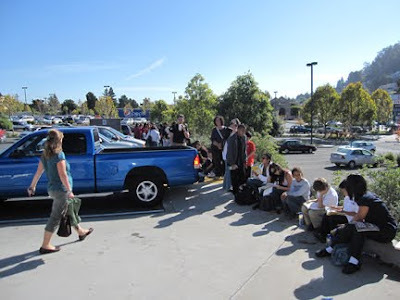 Jeff really wanted to start signing early so the kids wouldn't have to wait, but the ticket system made that hard to do. People who had stood in line longest to get the first tickets might not come back until the scheduled start at 5 p.m., and beginning early wouldn't be fair to them. Jeff reluctantly agreed to stick to the plan, and instead sat down to sign every Wimpy Kid book the store had in stock that hadn't already been bought by fans waiting outside. He autographed probably 400 or 500 books before he even began the actual booksigning. Jeff taking a call in the back room. Publicist Jason is at left and bookstore employees at right. I earned my keep by helping uncrate and stack books for Jeff to sign. Each box holds 40 books. Here's the one story I'm going to tell about Jeff. I was distracted doing something else when Publicist Jason started to hand me his credit card. Jeff waved him off. "Would you mind getting Jeff a Jamba Juice?" Jason asked. "No no," protested Jeff. "You don't have to." "I'd be happy to get you a Jamba Juice," I said. "It wouldn't be right," said Jeff. "Besides, you'd put it in your blog and make me look like a jerk." With boxes of books autographed and stacked, signing time rolled around. Announcements were made, lines formed throughout the store, a path was cleared between the back room and the signing table near the registers. Knowing I'd have no chance later, I said goodbye to Jeff and we lined up to pierce the throng, a phalanx of bookstore employees, Publicist Jason, Jeff, then me, with a couple of clerks guarding our rear. The door opened; we charged. Children squealed, women wept, and I think a blind man may have touched the hem of Jeff's garment and regained his sight. A few feet before we reached the table I peeled out of formation and POP! in an instant I was out of the WimpyWorld bubble, just another member of the mob that security wouldn't let stand around taking pictures. (The problem isn't the pictures, it's the standing. Gotta keep things clear and moving.) I signed the store's one copy of Whatever Happened to the World of Tomorrow? and left for home. Jeff at work. Barnes & Noble counted 2,800 people last night. Insane. Brian Epstein managed The Beatles. He couldn't play an instrument and no one knew who he was, but everywhere The Beatles went Brian Epstein went, standing behind them or just outside the shot. For two hours yesterday, I got as close I will probably ever get to being Brian Epstein, and it was strange and fun. But I don't think I'd want to be Brian Epstein full time. And I know for sure I wouldn't want to be The Beatles. This is a seriously awesome (and interesting) post. Nice to see good authors getting treated like rockstars.